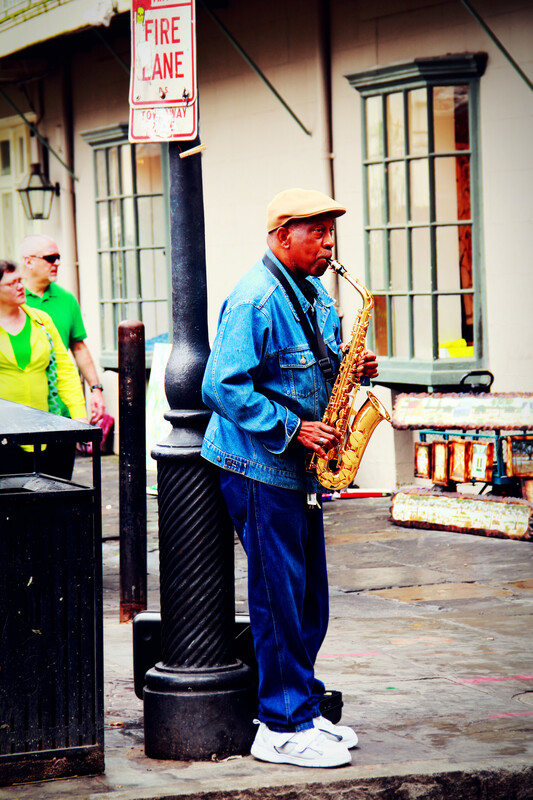 Jazz Man, New Orleans, LA | Ming's Photo Blog! New Orleans is a city of arts — and according to my recent knowledge from the Library of Congress, music belongs to arts in ancient classification of academic disciplines. Painters were sitting along the street drawing whatever coming out of their minds, ranging from the street view of Jackson Square to delicious raw oyster and crawfish; bands with young boys and girls were performing their self-composed songs, with the audience cheering here and there; behavior artists put on their costumes, standing still in the street as if they were sculptures. Among all the different forms of arts, one of them is somewhat special for New Orleans: Jazz. This city is said to be the birthplace of Jazz. Indeed, I was almost surrounded by this slow and melodious music: Every few steps, you would hear a different piece of Jazz, coming out of saxophone, trumpet or double bass, elegantly and beautifully. This entry was posted in Travel in US and tagged Culture, Louisiana, New Orleans, People, Travel. Bookmark the permalink.